While photography can help capture your product, a video can better showcase its capabilities to potential customers. Solar Camp, a solar tech start up company based in San Diego, came to Ready Artwork looking to have a photo and video shoot to feature their products. Our team had to coordinate a full day shoot for both video and photography, Our team scouted for models and a location that would be optimal for highlighting the products. This video needed to be less than a minute but still had all the relevant information and capture audience’s attention. 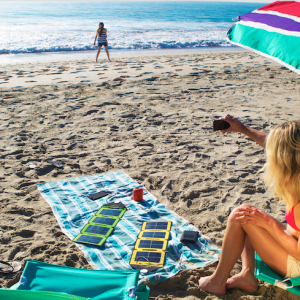 For the video, our team decided that it would be best to feature a family at the beach to display the products. Once these were finalized, we created a storyboard detailing what scenes we wanted for the video and which call outs were needed. We needed these different scenes to highlight the various features of the Paper-Thin Solar Charger. While the video would cut to different scenes, we wanted the entire video to still be linked thematically and make sense to the viewers. On the day of the shoot, our art director was on site along with the team and models to ensure that our vision for the shoot that we outlined in the storyboard was accomplished. After shooting, our team went in to add text callouts and upbeat music that would accompany the video. In addition, we added the logo, product name, and website at the beginning and end of the video. This video, along with the photography, were put onto the website and help potential customers see the product in actual use! Let us help establish your video marketing strategy this year! Contact our team today!